Cute, small, and parked in the CPS Energy parking lot, the BMW i3 is prepping for its role in a national study on plug-in vehicles assembled by CPS Energy, The Electric Power and Reliability Institute (EPRI) and BMW. BMW and CPS Energy are one of eight auto manufacturers and 11 utilities participating in the research. An estimated 225,000 PEVs currently populate US roads, with 5,000 in Texas. That number is expected to increase dramatically in coming years as pressure mounts to reduce carbon emissions that contribute to climate change. PEVs get their power by plugging into an electric outlet and storing that power in an onboard battery. That means no gasoline and no emissions. 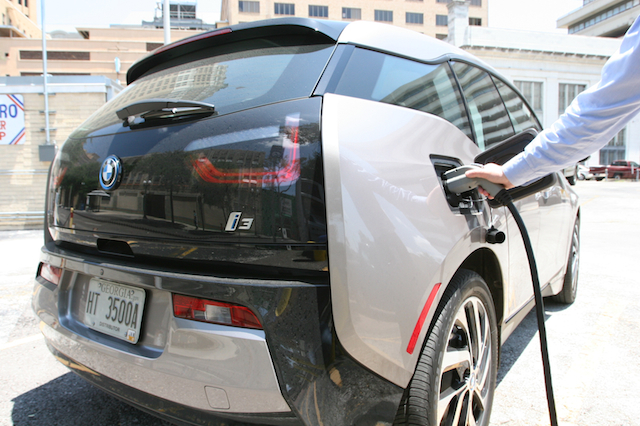 BMW America and CPS Energy are testing the BMW i3’s ability to stop or postpone charging during peak demand periods or other power emergencies. They aim to do that by programming demand response event parameters into EPRI and BMW servers, telling the cars to stop pulling power when demand is highest. Several internal charging events will be scheduled each week, lasting from 15 minutes to four hours. Participating in this study also allows CPS Energy to be directly involved in ensuring the effectiveness and the security of this and other technologies specific to PEVs. Nope, not gas. Electricity. And that means no emissions. The idea is that V2H technology would issue a signal to participating electric cars to back up part of the owner’s home for a period of time. “In essence, the car would provide the ability to remove the home from the grid when peak demand is straining the system,” Kirby said. Imagine that at some point in the not so distant future, your car may power your house. Made possible, in part, by CPS Energy.